For years, decks, elevated patios and balconies have been popular choices for homeowners when designing or remodeling their outside living spaces. Until recently, options have been limited primarily to wood or composite materials since natural stone, pavers and tile—while aesthetically pleasing—were too heavy and difficult to install on traditional wood joist framing. 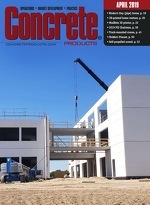 A decade after delivering the charter model of its next generation of Servo hydraulic concrete block and paver machines—each suited to legacy or competitor molds and delivering quick mold and height changes plus adjustments at the push of a button—Besser Co. has rounded out the Servopac family with its biggest offering. Engineering enhancements to the EPA Tier 4 Final Caterpillar M Series Small Wheel Loaders—926M, 930M and 938M models—plus K Series 924K, 930K and 938K models span standard and optional features that boost productivity, improve operating ease, and increase uptime reliability. Advanced Concrete Technologies, Inc. enters 2017 with a new line of affordable batch plants equal to a wide range of applications. The small footprint CentroMix models arrive on site pre-wired, pre-plumbed and factory tested for quick and easy installation—requiring merely a single electric, water and air connection to be up and running.